Would you be interested in aligning your values with your investment portfolio if you did not have to sacrifice your investment performance objectives? Have you ever looked at the companies you are invested in through your investment accounts and not liked the names of those companies, and felt that you wish you could do something different? With Socially Responsible Investing you can aim to align your investments with your social and environmental values. Our Socially Responsible Investing Portfolios are comprised of stocks, bonds, mutual funds and ETF's that can serve as a cornerstone of a well balanced portfolio. Our Socially Responsible Investing Portfolios have a dual objective of providing competitive returns while making a positive impact on society and the environment. Social Responsible Investing is a strategy that strives to align your personal values with your investments while making a positive social and environmental impact. This can also be done for investment funds of Non-Profit organizations and Foundations to match and support their missions. Socially Responsible Investing incorporates ESG analysis. ESG stands for Environmental, Social and Governance. At DE Management, we are hearing from our clients that they prefer to invest in companies that are making a positive difference in the world. We, along with our partners at The Wealth Consulting Group (WCG), believe our Socially Responsible Investing portfolios support all of these objectives. We help clients set and implement clear goals aligned with their needs, values, and objectives. We strive to be a leader in sustainable and responsible investing. 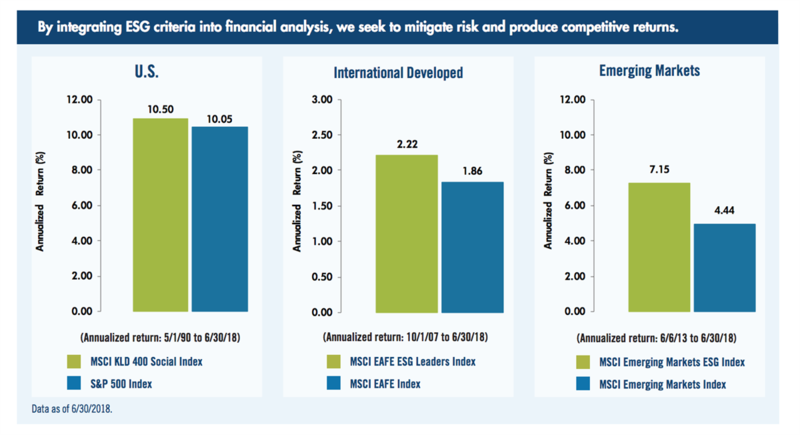 The charts below show ESG indices performance versus the performance of its comparable traditional indices. 2 Sustainable Signals: The Individual Investor Perspective, Morgan Stanley Institute for Sustainable Investing, February 2015. The MSCI KLD 400 Social Index has outperformed the S&P 500 Index by 0.42% annualized from 5/01/90 to 12/31/17. The MSCI EAFE ESG Leaders Index has outperformed the MSCI EAFE Index by 0.41% annualized from 10/01/07 to 12/31/17. The MSCI Emerging Markets ESG Index has outperformed the MSCI Emerging Markets Index by 3.43% annualized from 6/06/13 to 12/31/17. Comparable returns since index inception are shown gross which includes dividend reinvestment without a reduction from tax. As of 12/31/17, the returns for the MSCI KLD 400 Social Index were: 1 year: 21.61%, 3 year: 10.85%, 5 year: 15.90%, 10 year: 8.71% and Since Inception (05/01/90): 10.55% annualized. The returns for the S&P 500 Index were: 1 year: 21.83%, 3 year: 11.42%, 5 year: 15.80%, 10 year: 8.49% and Since MSCI KLD 400 Social Index Inception (05/01/90): 10.13% annualized. The returns for the MSCI EAFE ESG Leaders Index were: 1 year: 24.02%, 3 year: 8.44%, 5 year: 8.84% and Since Inception (10/01/07): 2.60% annualized. The returns for the MSCI EAFE Index were: 1 year: 25.62%, 3 year: 8.30%, 5 year: 8.39% and Since MSCI EAFE ESG Leaders Inception (10/01/07): 2.19% annualized. The returns for the MSCI Emerging Markets ESG Index were: 1 year: 40.90%, 3 year: 12.19%, and Since Inception (06/06/13): 9.93% annualized. The returns for the MSCI Emerging Markets Index were: 1 year: 37.75%, 3 year: 9.51% and Since MSCI Emerging Markets ESG Inception (06/06/13): 6.50% annualized. Data as of 12/31/2017.Time period of illustrations vary due to ESG index inception dates prior to comparative indices: MSCI KLD 400 Social 5/1/90; MSCI EAFE ESG 10/1/07; and MSCI Emerging Markets ESG 6/6/13. All MSCI indices include aggregated, multi-source histories prior to acquisition on 9/1/10. All performance referenced is historical and is no guarantee of future results. All indices are unmanaged and may not be invested into directly. There is no assurance that the techniques and strategies discussed are suitable for all investors or will yield positive outcomes. Investing involves risks including possible loss of principal. No strategy assures success or protects against loss. Investing in stock includes numerous specific risks including: the fluctuation of dividend, loss of principal and potential liquidity of the investment in a falling market. Bonds are subject to market and interest rate risk if sold prior to maturity. Bond values will decline as interest rates rise and bonds are subject to availability and change in price. Investing in mutual funds and/or ETFs involves risk, including possible loss of principal. International investing involves special risks such as currency fluctuation and political instability and may not be suitable for all investors. These risks are often heightened for investments in emerging markets.The return on ESG investments may vary versus if the investor made decisions based solely on investment considerations. Contact us to get a conversation started. WCG Wealth Advisors, The Wealth Consulting Group, Disciplined Equities Management, and LPL Financial are not affiliated with the above named entities.